In a large resealable plastic bag, combine the first five ingredients. Add the vegetables. Seal bag and gently shake so all vegetables are covered. Refrigerate for at least 1 hour. In pot large enough to partially cook the brats, bring beer to a boil. Place brats in boiling beer and flash boil them for about 3 to 5 minutes. Remove and chop each brat into half inch pieces. Drain and reserve marinade from the vegetables. 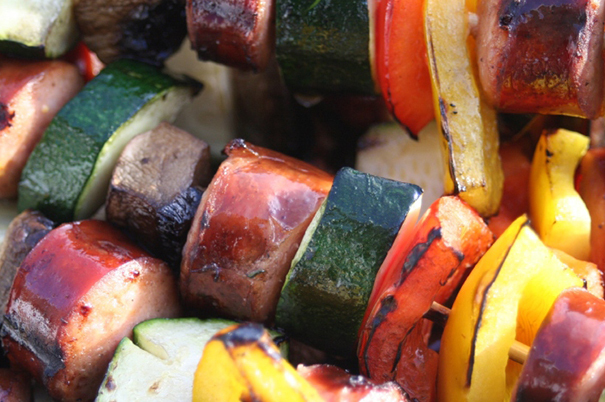 On six metal or soaked wooden skewers, alternately thread the vegetables and bratwurst. Brush with reserved marinade. Grill, covered, over medium heat for 10-15 minutes or until bratwurst is no longer pink and vegetables are tender, turning and basting frequently with reserved marinade.